I love baby toys because they are always so bright, soft and cute! Whenever I go to a baby shower, I include some sort of baby toy, usually tied to the outside of the package for added cuteness. Crinkle Friends “Brights” are the perfect toy for babies and toddlers! These new designs use bright, vivid colors and feature enough squeaks, crinkles and rattles to keep children happy and busy for hours. Aurora has recently added an adorable hedgehog, toucan, alligator and crab to its popular Crinkle Friends line, which already includes a frog, pig and cow. Each Crinkle Friend is as adorable as the next. These "bright" baby toys are bold, colorful, soft and squishy. They also make fun noises and sounds, and are easy for little hands to hold. Crinkle Friends are huggable stuffed infant toys made from soft material and helps baby with developmental skills. Designs use bright, vivid colors and patterns that invite baby to focus, stimulating vision. The textures invite baby to explore, stimulating tactile senses. While Crinkle, squeak and rattle awaken baby auditory awareness and is designed to keep infants and toddlers busy for hours; suitable for ages six months and up. 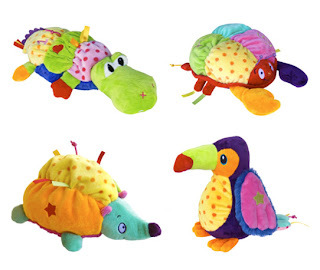 Crinkle Friend (hedgehog, toucan, alligator or crab) - Winners Choice! Disclaimer: I received a complimentary crinkle friends "bright" from Aurora for the purpose of writing a review and hosting a giveaway. Regardless, I only recommend products or services I use personally and/or believe will be a good fit for my readers. The views and opinions expressed on this blog are purely my own. Results may vary. No monetary compensation was received. I would love to win this toy!! !My sister just had a baby! Love Crinkle Timmy the turtle - so cute! Crinkle Toucan is so cute! Thanks for the cute giveaway! I like the Crinkle Pig. My favorite Crinkle Friend is the Toucan. The Crinkle Toucan is. So colorful! Timmy the Crinkle Turtule is adorable! Google Plus - Sherrie C.
I like the Crinkly Timmy the turtle. So cute! I like the cute toucan!